There are the things we want to do, and there are the things we have to do. Hanging new wallpaper in my family room was certainly not my first choice of weekend activities, but it had to be done. The great thing was it gave me plenty of time to daydream about my favorite pastime: whitewater rafting. I even came up with a list of my top five picks of the best whitewater rafting rivers in the world. Since some of your readers are probably avid rafters like me, I thought this would be a great challenge for them to think about their top five list of rafting destinations to see how it compares with mine. I’m sure it will help the wallpaper-hanging time fly by like it did for me. Patagonia is the sacred spot for most outdoor sport enthusiasts, and I would be remiss if my list did not begin with the Futaleufú River from that beautiful region. The Class V rapids of the Futaleufú River are a welcome challenge to experienced rafters, but there are also plenty of opportunities for novices and families to experience the wonder of exploring the alpine beauty of the South American Andes Mountains. The water itself is crystal blue glacier runoff that comes down from the high altitude lakes every season to push this untamed river through some of the most beautiful mountain scenery in the world. This list had to begin with a big dream, but for number two I wanted to pay tribute to one of my favorite rivers from the homeland. Middle Fork is a beautiful free river that is unregulated by damns, so the flow varies greatly throughout the season the way nature intended. These seasonal waters flow through some breathtaking forest scenery and give glimpse of majestic alpine views. However, it is the Middle Fork’s ability to seem brand new every time you visit that has earned this river the number two spot on my list. As a matter of fact, in 2003 a major landslide caused this river to change its ending. Now, the Cramer offers a perfect top-off to an exquisite river adventure. There are a few places in the world where everything comes together in just the perfect proportion. The Sun Kosi River is that kind of place. With the majesty of the Himalayas at the source and the Ganges as the destination, the Sun Kosi links two of the world’s most respected natural wonders. This river is not a trip of pure nostalgia though. The Class V rapids of this bone-shaking ride will challenge and delight experienced rafters as you barrel through narrow gorges rising near the border of Tibet and stretching through forested passes on the way to India’s jungle tropics. This river has it all: history, scenery and thrilling rapids. 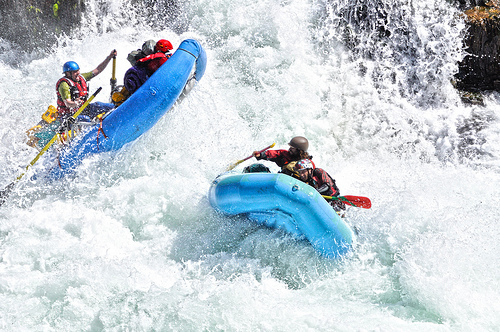 As all experienced rafters know, big rapids have to come from big water sources. Satellite images show how the Zambezi basin is a broad collection of wide waters feeding into the thundering majesty of the Victoria Falls before launching into a series of thin zigzagging gorges. The Zambezi’s waters are fast and long as they stretch over 23 rapids after the falls. This is easily the greatest whitewater river in all of Africa, which is why it is on this list. The dramatic backdrops of the Batoka Gorge are beautiful, but the splendor of the ride itself is what brings hundreds of visitors here each year. There are more rivers in the world with faster rapids and longer runs, but few can compare to the diversity of the North Johnstone River in Australia. Here, visitors will find plenty of Class IV and Class V rapids to experience, but that is not the only reason to visit. This river also offers an opportunity to behold the wonder and beauty of the far northern region of Queensland. From gorges surrounded by volcanic landscapes to the rain forests of Palmerston National Park, the North Johnstone River is as amazing to see as it is to ride. Unfortunately, a lot of rafters skip this destination because of the helicopter ride that it takes to get to the isolated start of this course. I know there are some great rivers that did not make my list like the Magpie River in Canada and the Río Upano in Ecuador, but I wanted to keep it short. Dreaming about the refreshing waters of these destinations made my weekend of wallpapering fly by. Thank you for allowing me to share this with your readers. I hope it will inspire other rafters out there, who are deep in a wallpapering project, to daydream about the world’s best rivers. This entry was posted in Africa, Australia, Idaho, South America, Travel, United States, Water Sports, White Water and tagged Whitewater rafting. Bookmark the permalink.